Dreams Are Real from Ryan Barger on Vimeo. "Time travel. Space Exploration. Violence. Drama. Love. Cats. Dreams." 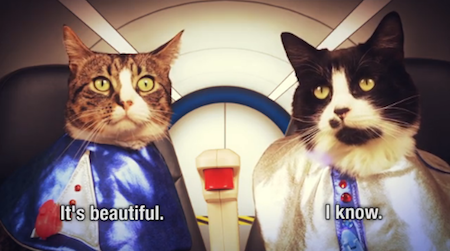 Filmmakers Ryan Barger and Katie Akana take you on an odyssey through the feline imagination in a magical music video featuring kitty bunk beds, flying cat bees, and one totally bitchin' feline band. Remember kitties, you can do anything you set your mind to. Now just sit back, relax, and enjoy the ride. This is just... YES. Yes, to all of it. Thanks for sharing! Advertise On Catsparella In September! Smucci Too! Luxury Cat Bed Set Giveaway Winner! Smucci Too! Luxury Cat Bed Set Giveaway! Squirrel Den Studio Cat T-Shirt Giveaway Winner!